The only through road running north south between Toorak and Commercial Roads, Osborne Street offers a convenient and enviable lifestyle – close to Prahran Market, South Yarra Station and the number 8 tram. 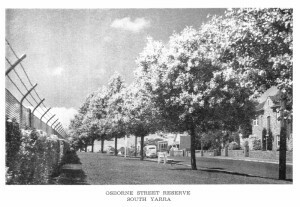 Osborne Street is one of South Yarra’s oldest. Originally sold as Lot 34 for nine pounds an acre 1849, the total area of land was 51 3/4 acres and it stretched from Gardiners Creek Road (now Toorak Road) through to Commercial Road. Hobson’s Bay Railway Company began planning a direct railway line from the City to Windsor and land that was part of a gully and not readily converted to residential streets was sold to them. During the period when the tracks were being laid the land between Osborne Street and Argyle Street was formerly separated by a rough but unusable track which was leveled as a highway. One of the first Doctors, Dr John Coats, opened his practice on the Toorak Road corner of Osborne Street in the 1850s and future Mayor of Prahran E L Vail pitched a tent next door before later building a two storey home on the property. At the time the area in the vicinity of Fawkner Street and Osborne Street had a Sawmill and a Brickmakers and that area extended beyond to Clifford’s paddock which fronted Punt Road. Number 139 Osborne Street was the home of the South Yarra Police Station from 1889-1974. Amid what would be considered a lackadaisical attitude towards security during the 1950s the police station was burgled. The break-in was discovered when the sergeant’s wife went out to get the morning milk. The case was placed in the hands of the Prahran C.I.B and suspects included, both current and former police officers who were interviewed and their houses searched. It was discovered that when the station was unattended the front door key was hidden behind a trellis. In full view of the public the constables would retrieve the key and unlock the door when returning to the station. The key to the strong box was hidden in a similar fashion inside the station. Needless to say the list of suspects was considerably widened but the perpetrator was never discovered.